The International AECIO Trophy celebrates its 30th birthday this weekend with the presence of approx.160sailors from five countries and seven regions. The AECIO Trophy involves the class farewell to the sailors of the Club who, because of age, must pass to a bigger boat. 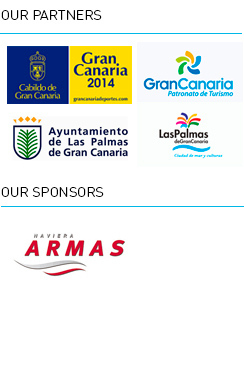 Besides RCNGC sailors, athletes from other islands and other communities will participate: Tenerife, Lanzarote and Fuerteventura; other communities: Catalonia, Cantabria, Galicia, Valencia and Murcia, and other countries: Poland, Sweden, Russia and Germany. The International AECIO Trophy for Optimist class is the second round of the Excellence Cup, a winter circuit which includes the International Meeting of Vigo (October 30 to November 1), the International Trophy of Torrevieja (28-31 January ) and the Palamós Trophy Nations Cup (18-21 February). Moreover, it is the third round of the Optimist Circuit of the Canary Islands, which begins in Tenerife with Pel Escuder in October, continues the Fuerteventura’s Cup in November and culminates in the Lanzarote Trophy in February. 9 tests have been scheduled between Sunday 27 and Tuesday 29. Information on transport and charter boats for European Laser Ch. already available. Catalans Gelpí and Rondeu and the Canary Naranjo, first leaders of the 30th AECIO Trophy for Optimist Class. REGATA DE CARNAVAL. CIUDAD DE LAS PALMAS DE GRAN CANARIA.